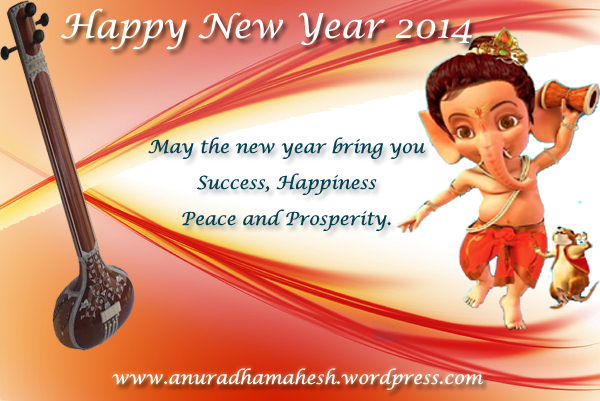 Very Happy and a Prosperous New Year 2014. We are at the close of the year 2013. Just doing a review on the contents of this blog and its reach. I am very happy to note that this temple of music has been particularly being more visited by the students of music on various lessons and raga appreciation. Everyday I receive several mails thanking for the posts and small articles/music lessons. I am indeed grateful to all the visitors for the whole-hearted and sincere appreciation given to this blog-which has now become an obsession for me. This blog on music has completed three years of successful posting on many topics related to Indian Carnatic Music namely Carnatic Downloads of Live Concerts, Carnatic Raga Appreciation, Articles on Music, Topics on Music Therapy, Carnatic Music Lessons, Singing Lessons along with some Spiritual Discussion Topics and Good Messages. This was possible only with the whole-hearted and sincere support of the visitors and friends of this blog for which I am very very grateful. In the year 2014, I wish to add a lyrics page with meanings as far as possible of the compositions of the various vaggeyakaras. The message conveyed in the krithi is very divine which is the sole reason for its long life. Lyrical excellence and the choice of words and their masterly combination, not to mention the raga bhava, makes each of these krithi one of the finest in the chosen raga. Song/Concept written 300-400 years back is being still rendered and cherished and ring in the ears of the rasikas mainly for its divine content and raga bhava. Great vaggeyakaras who wrote these krithis have told the fellow human beings on principles of life and importance of devotion/bhakthi for living a fulfilled meaningful life. Most of the krithis are personal experiences of their God realisation. In addition to all this, Shanmukhapriya School of Music would like to go the next level where sessions on bhajans, devotional music, Workshop on Group Krithis, Thiruppukazh, Thematic Krthis of composers, Lec-Dems on various topics related to Carnatic Music such as Aspects of Manodharma Sangeetham, Colours of Ragas, Role of Gamakas etc, to name a few, are planned to be conducted in the forthcoming year. There will be experts from the field of music to handle different sessions. There will be separate sessions and workshops for Veena students/Vainikas for preserving the spirituality and creating awareness of the sacred ancient Instrument that exists from the time of Vedas. Here is another great concert from the versatile artist..
#30-Why should one look into the hands in the morning ? The wealth Godess lies in the fore portion of the hand,Goddess of wisdom at its middle portion and Lord Govinda at its root. One should have a look on his hands while reciting the above hymn. The provision envisaged in the scriptures holds a great meaning. It fills the human heart with the sprouting of self-sufficiency and self-dependence. He does not look for any support from others, becomes habitual to look at his own hands in all acts pertaining to him. Whatever the nature of work, either good or bad is performed through hands.